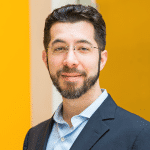 Dr. Boyden is the Benesse Career Development Professor and Associate Professor of Biological Engineering and Brain and Cognitive Sciences at the MIT Media Lab and the MIT McGovern Institute. He leads the Synthetic Neurobiology Group, which develops tools for controlling and observing the dynamic circuits of the brain, and uses these neurotechnologies to enable systematic repair of intractable brain disorders such as epilepsy, Parkinson’s disease, post- traumatic stress disorder, and chronic pain. NYSCF Innovator Develops Mature, Diverse Brain "Organoids"